Google has announced that it will publicly trial its upcoming Project Stream technology. This is Google's game streaming technology which it has been working on for some time now, trying to face down the challenges which it claims form the "next technical frontier for streaming," and will be much more demanding than pre-recorded video. From 5th October a limited number of invited participants will be able to play the new Assassin's Creed Odyssey in their Chrome browser thanks to the new streaming tech. In its blog post about Project Stream, Google reminds people why games streaming requires much more backend effort than streaming a movie. Movie viewers are comfortable with some level of pre-roll buffering, as long as their movie goes on to play smoothly for its linear whole. However, in a game the action unfolds in real-time and then every pixel and polygon has to be processed with visual effects, animation, simulation, physics and dynamics before it is sent to the screen. If the game is powered by a remote server then the networking tech delays, and controller input latency, makes it understandably more difficult to deliver a smooth gaming experience. 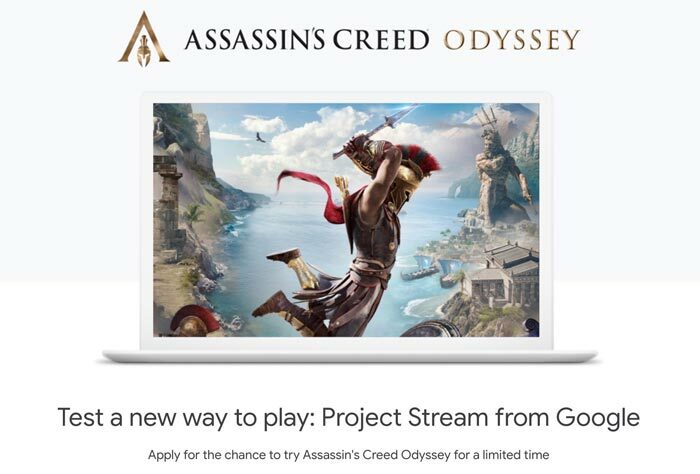 HEXUS have featured Ubisoft's Assassin's Creed Odyssey in previous news pieces and Google has chosen this game, and a partnership with Ubisoft, to help it refine the Project Stream game streaming technology. Google is inviting participants for the limited spaces in its public Project Stream trial. To qualify for the trial you must be 17 years or older and live in the USA and have a reliable 25Mbps internet connection to your home. Other stipulations are that you have a Google account, a Ubisoft account, and PC/Mac/ChromeOS/Linux install of Chrome 69 or newer. It is recommended that you have a wired USB controller or mouse, and that you don't try and play the game via laptop trackpad. Google says that the PlayStation DualShock 4 Controller, Xbox One Controller, and Xbox 360 Controller are compatible, depending upon your OS choice. With Google's impressive existing video streaming tech and capacity, hopefully Project Stream is the start of a hugely popular web destination with lots of classic streaming freebies alongside the income generating AAA releases. Personally I hate the whole concept of game streaming. If and when it catches on it'll probably mean the death knell to gaming PCs, as long as it's “good enough”. Much like video streaming has more or less ruined the market for video discs and audio streaming for audio discs. The UK probably isn't quite there yet, but in Denmark it's getting harder and harder to source physical copies. I mean i am for less waste. The older generation of gamers seem have this hoarding mentality thats not exactly progressive. But unlike video streaming, game streaming is a user driven application. With the emergence of e-sports and the demand it requires from games to be stable and lag free, it'll push the standard of game streaming to be a no compromise alternative. At least that's what I like to believe. So rent the game out and then pay more in the long-term without owning anything. At least a PC does more than gaming plus it also does not take into consideration not all internet connections are great anywhere or even things like latency. Instead as usual people nowadays get overexcited at any tech just because it is new and end up hoarding it whilst spending more. Let's rent more since that works out so well, right? So those RPGs that many gamers can play - how much will that cost you then?? Let's say 300 hours at least for something like Skyrim then?? Say at 50p an hour only £150. If you played 600 hours,£300 and so on. OFC all the interwebs will be inundated by random people saying you must getting the latest tech or be left behind who suddenly are nowhere to be seen outside any launches. $1000 to have a proper PC - considering that a good PC can last years then maybe you need to do the cost per year. If some of you are so anti-PC then stick to your $1000+ iPhones and Galaxy phones which people piddle money on all the time,and people seem to be endlessly upgrading to all the time. Let's also forget mods,etc which streamed games won't allow - so things like Skyrim's Bruma expansion would never happen and it was created for gamers by gamers.